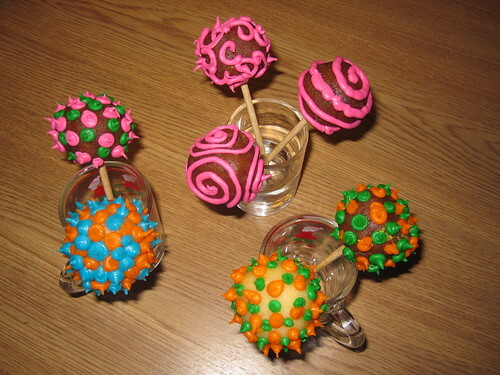 Last week-end, Bip and I had decided to finally try our hand at cake pops. I know they were the thing to do in 2010, but sadly I missed that boat. We were both quite busy and didn't get much of a chance to do research. And I decided to buy a ready made sponge cake, rather than bake one first. As it turned out, this was mistake number 1. We made quite a few ones on the way and I must say, neither of us expected that it would be such hard work. First things first - shopping. Never having purchased such an item as a sponge cake, we had to search through several of the food shops and venture to isles we had not been to before. The choice was underwhelming - one shop didn't have any sponge cakes, the other one had 3 types, two of which were basic sponge of different brands and one was gingersnap flavoured. So we purchased two of the lightest regular sponges we could find and two gingersnap ones. The idea was to dip the light pops in dark chocolate and the dark gingersnap pops into white chocolate or something like that. We bought some food colouring - Bip wanted to do bumblebees and piggies. We bought white ready to roll icing. Then on the off chance, we wandered in to the craft shop and found that they have increased their assortment to include coloured fondant and in suitable colours too. The only thing we didn't get was black icing - after the recent Halloween, they were fresh out. But they did have lolly pop sticks. I was also not familiar with the concept of frosting in tins, which seems to be the binding substance of choice in many of the American recipes and videos. A UK recipe called for Philadelphia cheese, but Bip wrinkled her nose at that, so I suggested mascarpone. Only one of the shops had that, puh, lucky. We also picked up some white and dark chocolate for cooking - I had a vague idea of using food colouring on the white chocolate. 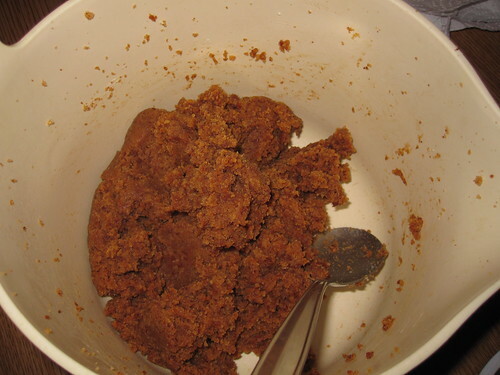 Crumble up the sponge cake - light one in one bowl, dark in another bowl. Divide the mascarpone equally between the two bowls and stir together until the crumbles come together and form a sort of dough. Scoop out walnut sized chunks and roll to round balls, then place on a baking sheet lined with greaseproof paper. Place in the fridge for 15 - 30 minutes to firm up. 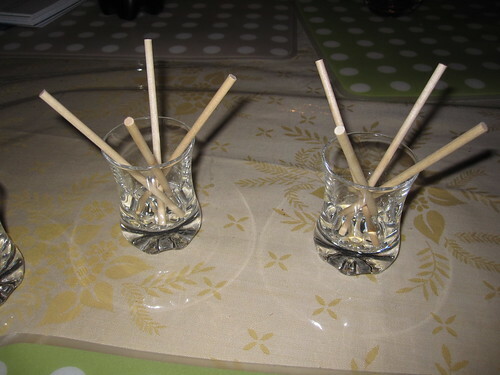 In the mean time, prepare the pop sticks - a piece of polystyrene is good here, we didn't have any, so resorted to using shots glasses. It sort of worked, once there were two pops in a glass to balance each other out. Melt some of the chocolate, preferably of the same/similar colour to the one that will be used for the pop dipping. 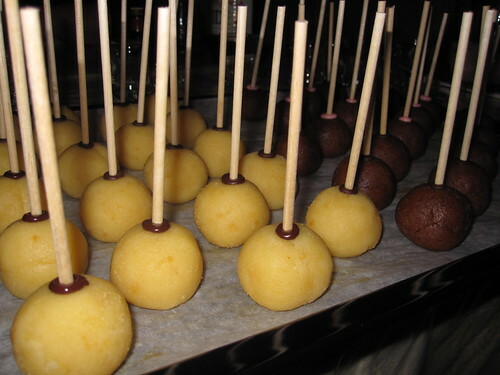 Take the tray with the cake balls out, dip a pop stick into the chocolate, about a cm. Then push into a cake ball, about half way in. Once they are all done, place in the freezer for an hour. Prepare the decorations - piggy noses and ears took time to make. Then melt the chocolate. White chocolate can be coloured a bit - a drop of red food colouring made it pink, but thickened it as well. Yellow food colouring was not as strong and by the time we had the right saturation, the whole thing had seized up, as chocolate does when it comes in contact with water. So careful. 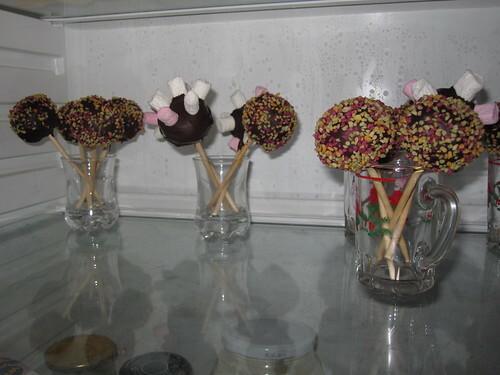 Then out with the frozen cake pops, quick and careful dip into the melted chocolate and then on with the decorations. Finally back in the fridge to make things set. Now this took most of the Saturday. The treasure and wonderful surprise was the Swedish meatball maker - this is an item that has been in one of the kitchen drawers in Sweden since as long as I can remember, a whim purchase from a second hand shop, I suspect. I also can not remember that this item has ever been used and so, I had started campaigning to get rid of it. The shame, oh the shame! As it turned out, it was perfect for scooping a good amount of cake mixture and getting it ready shaped into a ball. OK, so I rolled each as well, but more out of principle, than anything else. We chilled them and I melted chocolate in the microwave for the very first time - it's actually not at all bad, I always feared that I'd burn it. Cool. We dipped the pop sticks and pushed them in. Bip pushed one all the way through a cake ball and I think I pushed most sticks in too far too. Anyway, we put them in the freezer for only 15 minutes and that was a mistake too. Should have let them freeze completely. 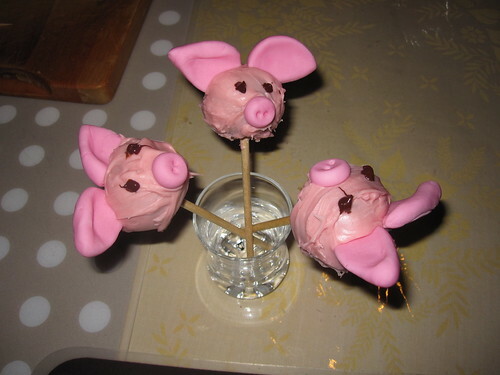 Some of the other mistakes we made were to push the piggy ears into the cake pops - this further weakened the pop, so that it sort of collapsed off the stick. 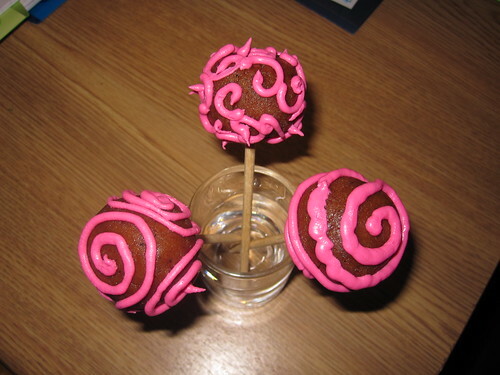 And they were way too big and made the cake pop top heavy, another reason for falling off the stick. And as the yellow food colouring caused the white chocolate to seize up, I mixed up some icing sugar with water and yellow food colouring, to a fairly thick paste and used that as coating for the bumble bees. It took longer to set of course, but worked pretty well on the whole. We weren't able to find white chocolate chips to use as wings, so I used a small flower shaped cookie cutter to cut out flowers from a thin wafer. 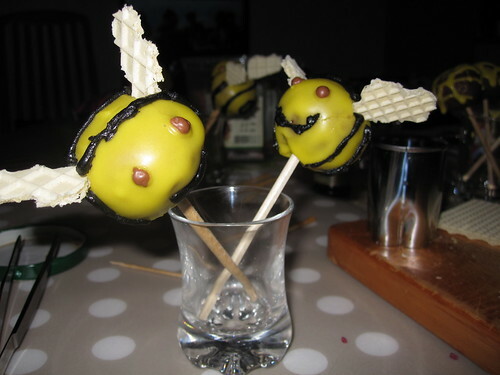 I then cut the flower in two halves, which we pushed into the cake pop as wings for the bumble bees. We used the daim sprinkles for eyes and once we ran out of chocolate, we used up some of the other colourful icing from the tubes to decorate straight on, that was the easiest and most fun I think, but it fell off very easily too, once it had set. 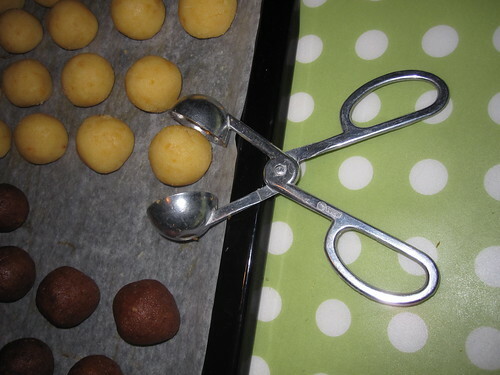 So to conclude - these need definitely to be made once more, but with home baked cake, careful on the chocolate, make sure there is polystyrene for the cake pops to set and not to push any of the decorations into the cake pops, but just glue them on. And let them freeze fully before dipping. When I asked my older niece Lou if she fancied a themed cake, she said she didn't mind. And having followed the second season of the Great British Bake Off, I decided to go straight for the most fantastic thing I saw there - the Chocolate and Orange Mousse cake! This was such a beautiful and original piece of edible art work and such an interesting method of making, I felt no hesitation at having a go at it. The basic idea is to make two thin rectangular sponges from joconde. From these two rounds and two strips are cut out and put together to form a circular box. The middle is filled with the chocolate mousse. The interesting part is that a joconde paste is first made and coloured. 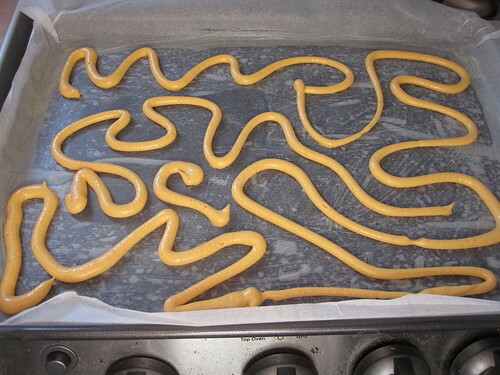 It is then piped in swirls onto paper lined baking trays and these are put in the freezer until the paste has frozen solid. 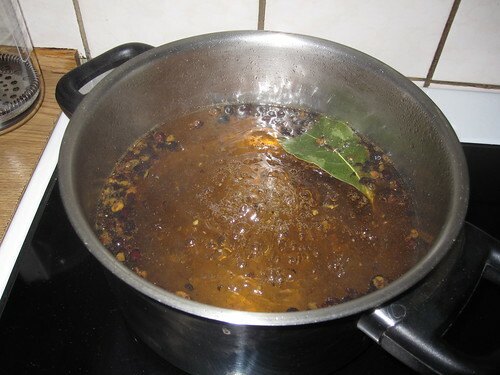 This ensures that the pattern remains when the main sponge mixture is poured over it. Cream the butter, icing sugar until fluffy. Add the egg whites slowly, while still whisking. Fold carefully in the flour. Add food colouring as desired. Brush melted butter onto two shallow baking tins (45 x 30 cm with an edge!). Place baking paper on top and make sure there are no air bubbles or folds on it. Pipe the paste in swirls and place in the freezer for about 1 h.
Whisk the egg whites until soft peaks stage, then add the granulated sugar and whisk further until stiff peaks form. Cover with cling film to prevent it collapsing and set aside. In a separate bowl, whisk almonds, icing sugar and eggs until pale and fluffy. Then add the flour and the cocoa powder while still whisking. Carefully fold in the meringue into the mixture. 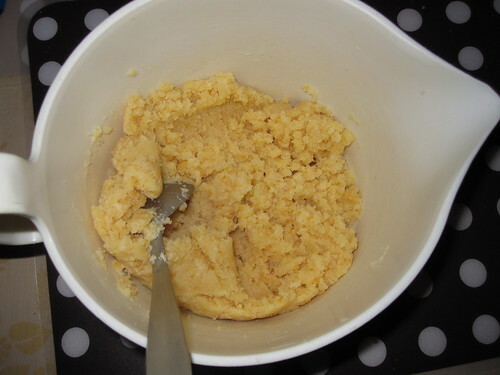 Mix about a cup of the sponge mixture into the clarified butter, then add the butter mixture into the sponge. Remove the baking trays with the joconde paste from the freezer and pour the sponge over the swirls in a thin layer, about 1 cm thick, level carefully and bake for 5 - 7 minutes until the sponges have coloured lightly (will be difficult to see, since they are chocolate coloured to begin with). Once out of the oven, place a sheet of grease proof paper over each baking tray, then turn over the tray to release the sponge. Remove the grease proof paper the sponge was baked in. This reveals the pattern. Let the sponges cool a bit. Strain the orange juice, then dissolve the gelatine in it, using the instructions on the packet. In a separate bowl, mix the zest and chocolate with the egg yolks. Add the orange juice with the gelatine. Whip the whites to stiff peaks and fold gently into the chocolate mixture. Whip the cream to soft peaks and fold into the chocolate mixture. Cut out two circles and two or three narrow strips from the sponges. The cake needs to be built inside a round cake tin - the circles should be a couple of cm smaller in diameter than the cake tin. Place one circle at the bottom of the round tin, fit the strips around the sides, making sure there are no gaps anywhere. 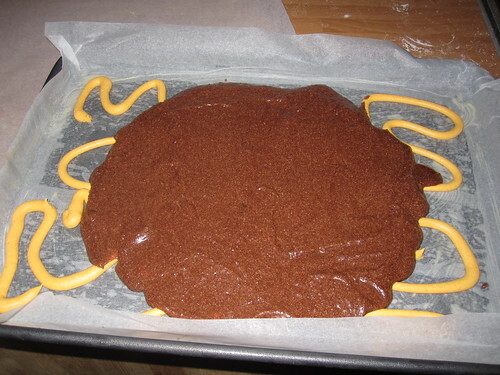 Pour in the chocolate orange mousse, then cover with the second circle. Cover and refrigerate until required. Just before serving, decorate by piping whipped cream and cut out twirls of orange zest. 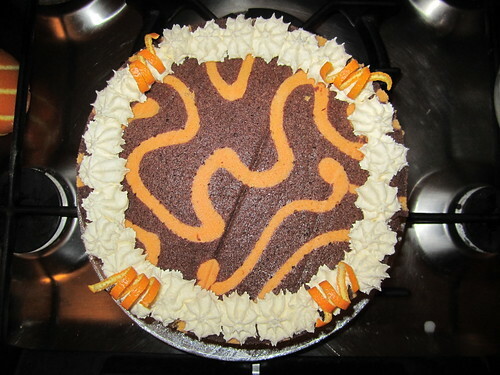 Now for some reason, the recipe published on the BBC web site was missing the instruction to place the swirl patterns in the freezer. But I'd seen the show, so I know that this needed to be done. What was a more unpleasant surprise was that the orange joconde paste resulted in some 4 - 5 times more than I actually needed. I have adjusted the recipe above accordingly, but I also have three more batches of orange joconde paste in the freezer for future practice. I also gravely mis-judged the sponge and opted for making a slightly smaller, but taller cake. Unfortunately the amount of mousse I ended up with was far from enough and you can see the 3 cm of edge I had to cut off because of this. I don't see how this amount would fit in the larger cake described on the BBC web site. Having said that, the double cream exhibited some massively unexpected behaviour. I have whipped double cream in the past and it has worked fine, I just would get slightly less volume. But this time, within seconds it almost turned to butter. So the mousse didn't perhaps get the volume it was supposed to have. At serving time the next day, Lundulph had to whip the remaining cream by hand and again after a few beats with a balloon whisk, the thing had gone to stiff peaks. Really not sure what happened there, it wasn't out of date, I checked! There was also the issue of baking: 5 - 7 minutes just didn't seem enough and I ended up baking for almost 15 minutes. 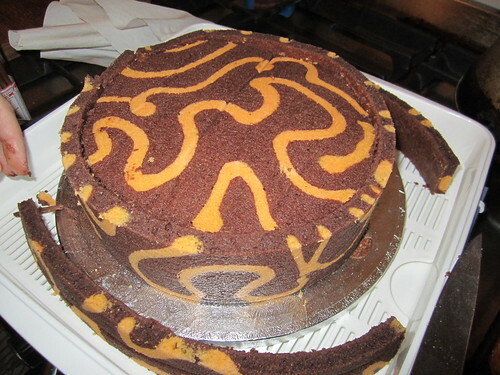 This was a mistake, as it resulted in a drier sponge, which cracked at the patterns, when I fitted it into the cake tin. Could also have been that I made a smaller diameter cake of course. So don't get tempted to leave it baking for longer! 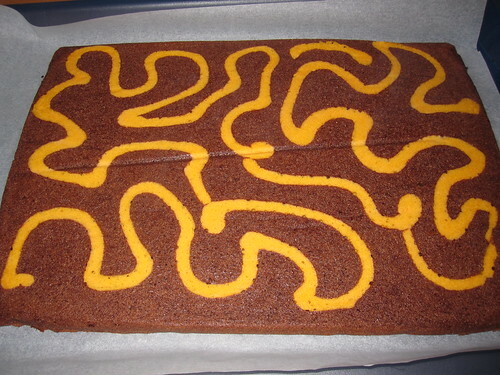 I also decided to skip one part of the decoration - a layer of gelatine made with orange juice. On the show, it was yellow, not orange and I didn't think it added any value to this otherwise so very impressive cake. As always, I do not use enough gelatine to make things firm up and so, after Lou cut the first piece, the mousse just poured out like some sort of goo. I have tried to adjust the recipe above for that as well. 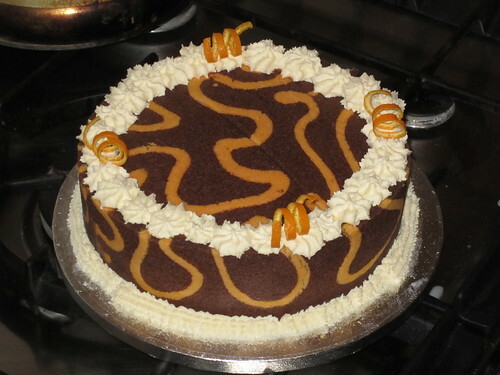 On the whole it was a very tasty cake actually and disappeared in the usual manner when we celebrate a family birthday. Lundulph had some good ideas - he thought this would be really great to do with green swirls and chocolate mint ice cream as filling. I concur and so I will make a second attempt in a couple of weeks when he comes over to visit. An idea that occurred to me is that you could plan ahead and draw specific patterns on the greaseproof paper that lines the baking tin and even write words on it. But you must do that in mirror writing. Then when you turn it out, the writing will be incorporated into the sponge. So I might try that as well. There seem so many possibilities on this technique. The many off-cuts from the sponge went into a big box in the fridge for snacking purposes and lasted well over two weeks after the initial baking and very little staleness was noticeable. What I didn't do was to try and freeze some of it, to see how it reacts to that. So that I know if I need to take out a cake with ice cream filling early or at last minute before serving. Well, I'll find out soon enough. This is a dish from Northern Sweden, and translates roughly to "frost lump". 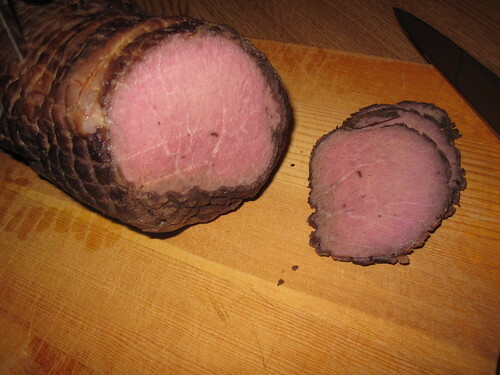 It is a piece of meat, most often moose, but other meats are OK too. It is roasted at a very low temperature, under 100 degrees C for a very long time and from frozen! It is then left in a salt solution for several hours and is sliced very thinly and served cold with potato gratin or such. Doctor Cutie made this for us when we went to visit them last Christmas and it was wonderful! So when my Mum was clearing out the freezer and spotted a nice size of inner thigh from moose, that's what I said I'd do. And so the frozen piece of meat went into the oven which I set to 80 degrees C, at the bottom shelf at around 20:30 on Friday night. Some 3 hours later, when my parents came home from a concert, Mum helped me push a meat thermometer through it and set the oven to keep cooking until the centre had reached 70 degrees C. It had reached 35 degrees C, so based on my very random calculations, the final temperature would be reached around 4 am. And I wasn't sure the cooker would stop as I'd told it to do - there was no info about this feature in the manual. But having a built in worry alarm, I woke up just after 4 am and wandered off to the kitchen for a check-up. The inner temperature was now at 55 degrees C. OK, cool, so another couple of hours to go. I turned up the heat to 100 degrees C, to be on the safe side. We were planning to eat it for lunch after all. Actually I got up at 7 and started on the Danish pastries, and the thing was still not ready. My Mum got up and I quickly turned down the heat to 80 degrees C again. It was another hour and a half, when the cooker bleeped and switched off. 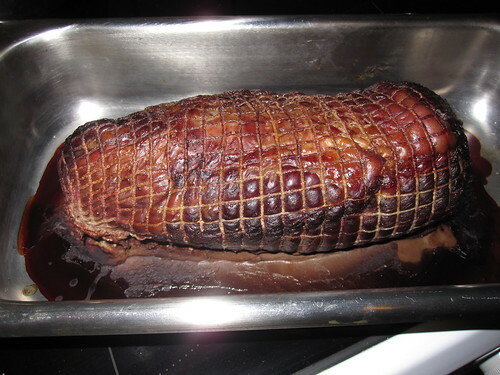 Place the piece of meat in a lidded container or a heat tolerant plastic bag, like a roasting bag. 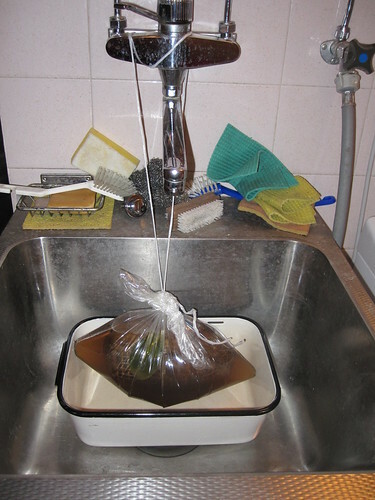 Pour over the brine and close the lid or tie the bag. Let stand for 4 - 5 h.
Remove from the brine, pat dry and slice thinly. Serve with potato gratin or a warm potato salad. The meat should be cold. Specialised contraption to ensure the whole piece of meat is covered during the soaking period. What it looks like inside. But unfortunately, I should have had more faith in the cooking instructions and not fiddled with the temperatures. I also thought that 1 dl of salt was way over the top and only used half, so very little had penetrated through. So less fear salt-wise too. What we ended up with was something with a very spongy texture and that tasted of over-cooked liver. I didn't like it at all. Must ask Doctor Cutie how she did hers, because the one she made was fantastic. The only positive thing was that it was very easy to cut, but that really isn't the main point of food, is it? 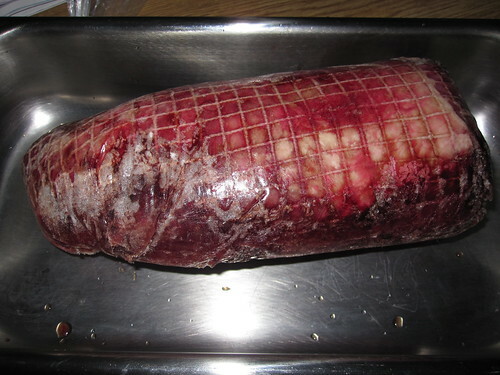 Now the piece of moose was around 1.5 kg and the brine was just about enough to cover it. For a bigger piece, the brine needs to be scaled up. After watching most episodes of the second Great British Bake-off (except the last one, don't tell me who won, please) and with some regret that I couldn't have tried for it even, I felt I needed to tackle the issue with puff pastry and declared my intentions to my Mum. Her reaction was, why bother, when you can get ready made from the shop? I disagree, I want to be able to know how to make my own, what if civilization as we know it collapses? What if the war comes? Or any natural disaster for that matter and there is no puff pastry in the shop? You've got to know how to make it. So there! And so, I scoured my old haunts of blogs for recipes. See, when I went to my baking master classes, we made puff pastry with yeast and I wasn't really sure about that. So I made two batches - one with yeast and one without. 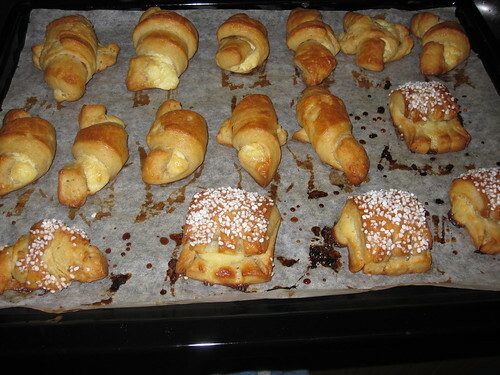 Due to unforeseen circumstances, I had a bit of a delay on my planning and so had to freeze both batches in the end and make the Danish pastries the following week-end. Now, I can't even find the recipes I used. But one thing was certain - as said by a French patissier on the Great British Bake-off - it's equal parts dough and butter. So that was the guiding light. The dough without yeast didn't seem to come together very well from the start, I kneaded and kneaded and the results were a very poor excuse of gluten development. But I got tired after a while and moved onto the next step - chilling etc. The second batch was with yeast and it developed much better. Very strange - all ingredients came out of the same packets, really the only difference was the yeast. Good gluten, good everything. Oh well. Maybe my attitude improved inbetween or something. I had a good banging away at the butter with the rolling pin. My Dad even came rushing to the kitchen to ask if I was intending to demolish the house. That bit was fun, though. So roll and fold, roll and fold and pretty soon no-yeast dough was too thin and broke in several places, though I was very careful not to get things too warm and the butter oozing out. But I had a feeling the damage had already been done here. The second batch was much easier to roll, easier to control etc, but still it felt like there was too much butter for the dough. The next week-end Lundulph came to visit and so I was going to make Danish pastries for breakfast. I let both batches thaw thoroughly in the fridge overnight, then I got them mixed up and left the non-yeast one rise, while the yeast one went straight in the oven. So the result was massively greasy, not well risen at all (by any means), but with quite clear layers and fully edible, although not too great amounts. So on the whole, progress, but still a massively long way to go. Maybe I should try rough puff next time. I did play around quite a bit with the shapes, that was great fun, though my Mum was very concerned that I left too much space between each. 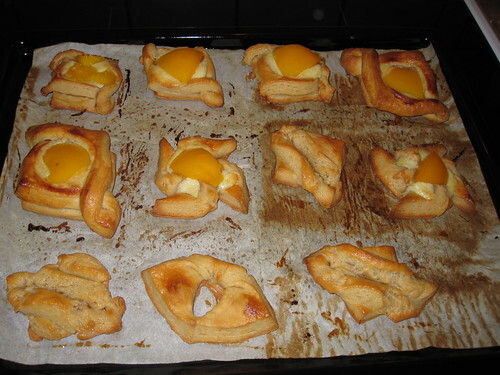 The croissant-y shapes are filled with crumbled up feta cheese mixed with eggs. The twirls have a dab of créme patissière and a well drained peach on top. 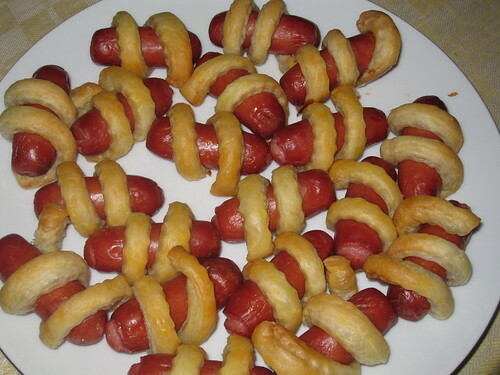 Of course - cut it in strips and wrap around cocktail sausages. That's pretty much it. 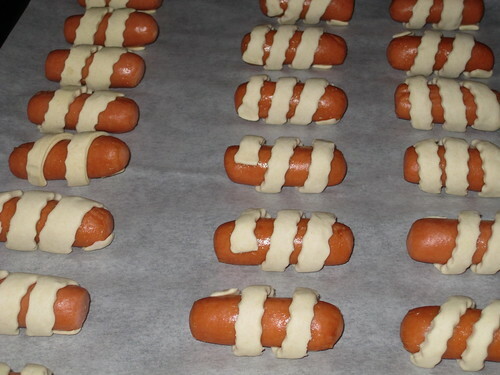 And bake them on 200 degrees C.
I didn't even brush them with egg wash. If you remember back in March, I found an old magazine with recipes. Well, I've tried two more of the recipes, again the really quick ones using rolled out puff pastry. Visually perhaps not entirely successful, but very tasty nevertheless. On the right of the picture we have Kejsarkronor, which translates to Imperial Crowns. 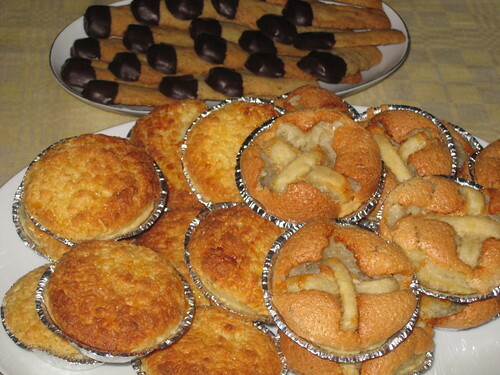 On the left, there are Kokosformar or Coconut cups. At the back, there are chocolate cigars, but made with coconut fat. No difference in taste as far as I could tell, but oh so very difficult to incorporate, it has a much higher melting point than butter. So, to the cousings of the mazarines. 340 g puff pastry, thawed but cold for each of the fillings below. Pre-heat the oven to 190 degrees C (fan assisted: 175). Take two pieces of the puff pastry and press together. Then on a floured surface, roll out as thinly as possible. Let it rest for a few minutes, so it doesn't shrink. Cut out as many large circles as possible and place into aluminium foil cups, pressing down to remove any air trapped underneath. 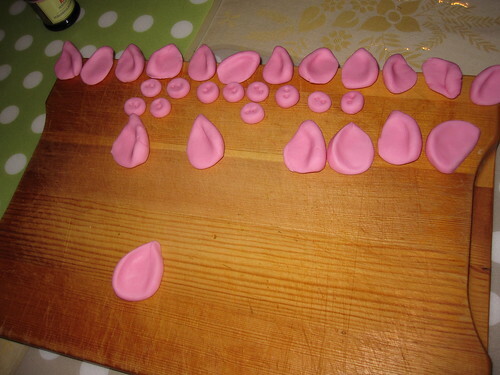 Cut-outs of the dough can be squeezed together and rolled out anew. Let the dough rest for a few minutes more in the cups. For Kejsarkronor: blend the marzipan and sugar, then add the whites a little at a time, then let stand to swell for 30 minutes (up to overnight is OK). For Coconut cups: Stir together all the ingredients and let rest and swell for 1 h.
Fill up the cups with your choice of filling and to the brim, even with a bit of a top on. For Kejsarkronor: Cut out 1 cm wide strips, two for each cup and place in a cross over the filling and tuck in at the edges. Bake in the middle of the oven. 20 minutes for Kejsarkronor, 15 minutes for Coconut Cups, until they get a nice golden brown colouring. For Kejsarkronor: Bring the apricot jam with the water to the boil, then brush the Kejsarkronor once they are out of the oven, to give them a nice shine. I made these back in May for my birthday. Lundulph certainly liked them. There were a lot of them too and they were pretty big, so it took some time to finish them. They held pretty well in a box in the fridge. The Kejsarkronor collapsed a bit sadly. Maybe I didn't fill them up enough. Well, doesn't time just fly? I have been swamped with work pretty much the whole of Summer and hadn't realised that I last posted in mid-March! And being busy at work means of course that I haven't been cooking much, certainly not much new stuff. Then the old computer died, literally and the agony of finding a new one. Which I've grown to hate lately, it gives me more trouble than my old one even. Still, I do need to do some posting and catch up on the few new things I've done and mistakes I've made. Looking at the weekly stats of the blog, I've come to realise that it still stays steadily on about 25, which kind of implies that it's mostly bots that visit it. Oh well, it's good to be able to access my recipes whenever I am online, if nothing else.